Android 4.4 Kitkat is released now and Nexus 5 is the first smartphone which is powered with the latest android version. The new Kitkat has lots of new features and application, Google launcher is one of them, currently the launcher is an exclusive to the Nexus 5. As per the sources the new launcher won’t be available for the other Android smartphones. But thanks to XDA developer who managed to get the new launcher from the Nexus 5 factory image. So if you don’t have the nexus 5 phone and want to try the new launcher on your android smartphone. 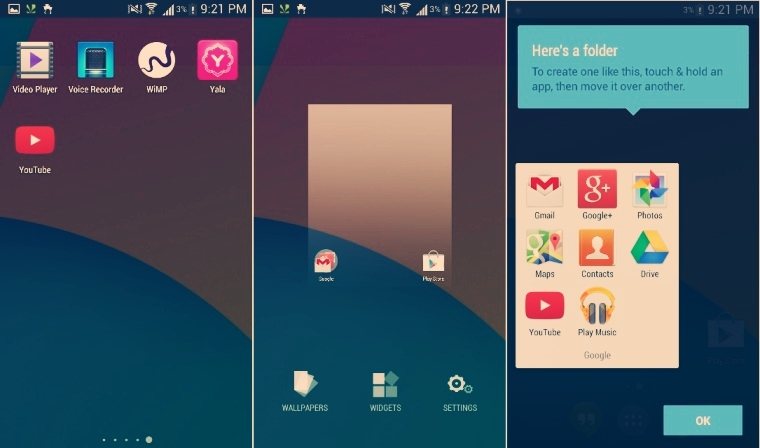 Today in this article we will be helping you to install the new Google Kitkat Launcher on your smartphone. Read all the instructions very carefully and follow them step by step on your phone. No need to root you device and no need to install any other desktop application or drivers to complete this process on your phone. All you have to download and install three different apk files on your phone. We tested all these file son our Samsung Galaxy 4 and LG Nexus 4 and all the launcher work fine without any problem. 2. On the folder you will see the three apk files “PrebuiltGmsCore.apk”, “Velvet.apk” and “GoogleHome.apk” file. 3. Connect you android to the PC via USB cable and move all the three apk files on your android smartphone. 4. Once the file are moved on your phone, disconnect the phone from PC. 5. Open the File manager on your android smartphone and browse for the files that you moved on your device above. 6. Install all the three apk files one by one on your phone and follow the onscreen instruction to complete the installation process on your phone. 7. Once the installation process is finished, press the Home Button in your device to choose the Google launched as your default. If you face any kind of problem with the application or the installation process, Do let us know in the comments section. For more android tips and tricks, check out our Android section here.